NASA's Wide-field Infrared Survey Explorer (WISE; Wright et al. 2010) mapped the sky at 3.4, 4.6, 12, and 22 μm in 2010 with an angular resolution of 6.1" 6.4" 6.5" & 12.0" in the four bands. WISE achieved 5σ point source sensitivities better than 0.08, 0.11, 1 and 6 mJy in unconfused regions on the ecliptic in the four bands. Sensitivity improves toward the ecliptic poles due to denser coverage and lower zodiacal background. The WISE Preliminary Release includes data from the first 105 days of WISE survey observations, 14 January 2010 to 29 April 2010, that were processed with initial calibrations and reduction algorithms. Primary release data products include an Atlas of 10,464 calibrated, coadded Image Sets, a Source Catalog containing positional and photometric information for over 257 million objects detected on the WISE images, and an Explanatory Supplement that provides a user's guide to the WISE mission and format, content, characteristics and cautionary notes for the Release products. Ancillary release products include an archive of over 754,000 Single-exposure Image sets and database of over 2.2 billion source extractions from those images, and moving object tracklets identified as part of the NEOWISE program (Mainzer et al. 2011). Access to the WISE Preliminary Release Image and Source data products is via the on-line services of the NASA/IPAC Infrared Science Archive (IRSA) (available April 14). NEOWISE-reported moving object tracklets are accessed from the IAU Minor Planet Center. Research using WISE Preliminary Release data is eligible for proposals to the 2011 NASA ROSES Astrophysics Data Analysis Program. Additional information on the ADAP is provided in Appendix D.2 of ROSES. See the Preliminary Release sky coverage See if a sky position or object is in the Release area. 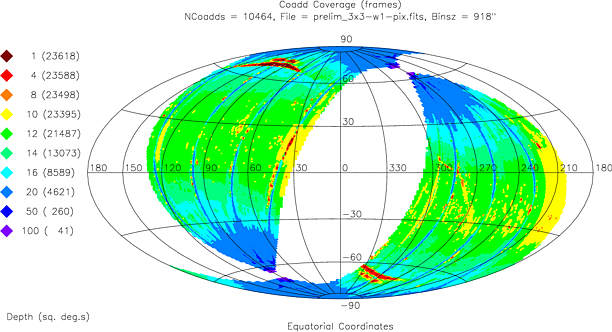 Figure 1 - Equatorial aitoff projection sky map showing the area covered by the WISE Preliminary Data Release. The colors encode the average number of single 7.7/8.8 sec WISE exposure frames covering 15´ × 15´ bins. The legend on the left gives the cumulative area in square degrees as a function of frame coverage depth. Figure 2 - Differential area as a function of average frame depth-of-coverage in the Preliminary Release, computed in 15´ × 15´ bins. The survey depth-of-coverage varies across the sky because of the WISE scanning strategy, as shown in Figure 1. There are typically 12 independent exposure framesets contributing to each point on the sky near the ecliptic plane. All four bands were imaged simultaneously, and the exposure times were 7.7 sec in W1 and W2 and 8.8 sec in W3 and W4. The frame depth-of-coverage increases towards the ecliptic poles, reaching a maximum of ~260 frames at the highest ecliptic latitudes in the Preliminary Release (Figure 2). Local decreases in frame coverage are caused by filtering out exposures that are considered to be of lower quality because of contamination by scattered moonlight (within 20° of the ecliptic), image quality degradation due to flight system motion, or other events. Pixel-level frame coverage information is provided in the WISE Image Atlas depth-of-coverage maps. The WISE Preliminary Data Release area is comprised of 10,464 Atlas Tiles, each Tile being 1.564°x1.564° in size and built on an equatorial projection. The full sky is tessellated with a grid of 18,240 Tiles for the purpose of combining the WISE Single-exposure images and extracting final source information. The Tiles are distributed in 119 iso-declination bands with 238 Tiles on the celestial equator and six Tiles in the |δ|=89.35° declination band. Tiles overlap by 180" in RA and Dec on the equator, and the RA overlap increases towards the equatorial poles. The 10,464 Tiles included in the Preliminary Release are the subset that are fully contained within the ecliptic longitude range given above. Use the following service to determine if a location or object is in the Preliminary Release area, and if so, the Tile in which is located. Figure 3 - (top row) 3.4, 4.6, 12, 22 μm intensity images, (center row) depth-of-coverage maps, and (bottom row) uncertainty maps for the Atlas Tile 0944p227_aa11 that contains the supernova remnant IC443. The color scale on the bottom of the picture refers to the depth-of-coverage maps. Intensity images - Four spatially registered images, one in each of the WISE bands, produced by coadding multiple 7.7/8.8 sec Single-exposure image covering the Tile area. 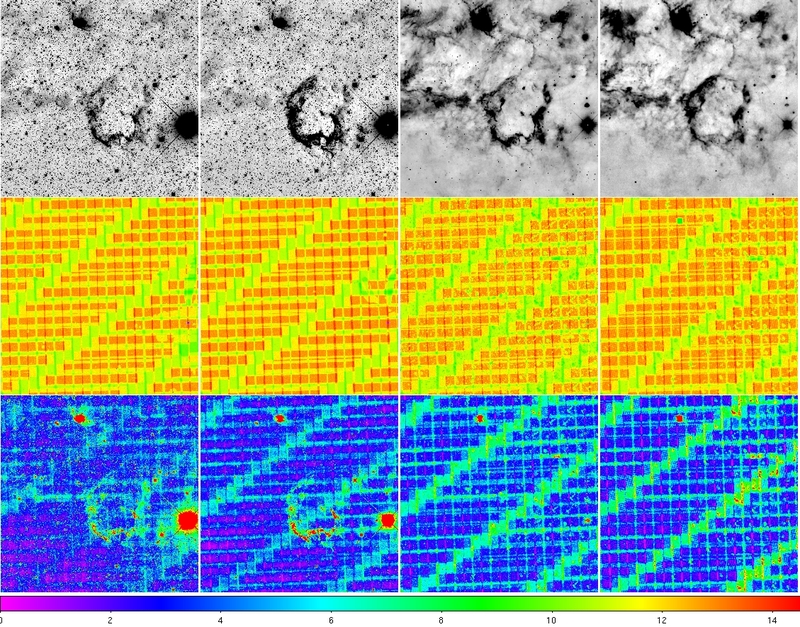 Pixel outlier rejection is used during coaddition to suppress transient events such as cosmic rays, hot pixels and satellite trails. Depth-of-coverage maps - Four maps, one in each WISE band, that provide the realized frame coverage for each pixel in the corresponding coadded intensity images following outlier rejection. Uncertainty maps - Four images that give the propagated uncertainty estimate for each pixel in the corresponding coadded intensity images. The uncertainty maps are used for proper error estimation in photometric measurements on the intensity images. J2000 positions and uncertainties reconstructed using the 2MASS Point Source Catalog as astrometric reference. Astrometric accuracy is estimated to be ~200 mas RMS on each axis for sources brighter than W1<13.0 mag. Approximately 25% of fainter sources are known to suffer from a declination bias of up to approximately 1" caused by an extraction software error in the early data processing. This bias does not affect the right ascension coordinate. Photometry and uncertainties in the four WISE bands. Photometry is performed using point source profile-fitting and multi-aperture photometry. WISE 5σ photometric sensitivity is estimated to be better than 0.08 0.11 and 6 mJy (16.5, 15.5, 11.3, 7.9 Vega mag) at 3.4, 4.6, 12 and 22 μm in unconfused regions on the ecliptic plane. Sensitivity is better at higher ecliptic latitudes where coverage is deeper and the zodiacal background is lower, and poorer when limited by confusion in high source density or complex background regions (Figures 4-6). Saturation affects photometry for sources brighter than approximately 8.0, 6.7, 3.8 and -0.4 mag at 3.4, 4.6, 12 and 22 μm, respectively. Valued-added columns that include measurement quality flags, image artifact contamination flags, extended source and variability flags, and association information cross-referencing WISE sources with the 2MASS Point and Extended Source Catalogs. Relative photometric calibration for WISE source photometry is made using measurements of a network of calibration standard stars near the ecliptic poles. Information about the WISE bandpasses and relative spectral response curves is available here. 3.4-4.6-12 μm color-color diagrams drawn from high and low galactic latitude regions in the Preliminary Data Release Source Catalog are shown in Figures 7 and 8, respectively. Figure 4 - (top) Differential WISE Source Catalog counts in a 116 deg2 near l,b=225°,-55° with average frame depth-of-coverage of ~16. (bottom) Average photometric uncertainty as a function of source brightness. Figure 5 - (top) Differential WISE Source Catalog counts in a 125 deg2 near l,b=303°,-27° with average frame depth-of-coverage of ~24. (bottom) Average photometric uncertainty as a function of source brightness. Figure 6 - (top) Differential WISE Source Catalog counts in a 116 deg2 near l,b=338°,-1° with average frame depth-of-coverage of ~16. (bottom) Average photometric uncertainty as a function of source brightness. Figure 7 - WISE 3.4-4.6-12 μm color-color diagram for a 116 deg2 region at l,b=225°,-55°. Green contours trace the density of sources in color bins. Click here for an annotated version of the color-color diagram showing the location of different classes of objects. Figure 8 - WISE 3.4-4.6-12 μm color-color diagram for a 116 deg2 region at l,b=338°,-1°. Green contours trace the density of sources in color bins. In addition to the Image Atlas, Source Catalog and Explanatory Supplement, the Preliminary WISE Release will include several ancillary data products. Single-exposure Image Sets - 754,854 calibrated 1kx1k pix @2.75"/pix FITS image sets for the individual 7.7/8.8 sec WISE survey exposures. Each image set consists of four intensity images, noise maps, and bit-masks indicating pixel use status, one for each WISE band. Single-exposure Source Database - Database of 2,236,310,549 "source" detections from Single-exposure images useful for time domain studies and follow-up of objects in the Source Catalog . This database contains detections of real astrophysical and solar system objects, as well as spurious extractions of low SNR noise excursions, transient events such as cosmic ray strikes and noisy pixels, and artifacts and scattered light from bright sources including the moon. Moving Object Tracklets - As part of the NEOWISE program, tracklets (i.e. sets of time-tagged positions) of asteroids, comets and planetary satellites were identified and reported to the IAU Minor Planet Center (MPC) within 10 days of detection by WISE. These tracklets, comprised of both previously known and WISE-discovered solar system objects, have been vetted by the MPC and represent the most reliable database of solar system object measurements by WISE. NEOWISE-identified tracklets may be accessed via the MPC. Known Solar System Object Possible Association List - Database of asteroids, comets, planets and planetary satellites, known at the time of data processing, that are predicted to be in the FOV of WISE single exposures. For objects with predicted positions in close proximity to a WISE Single-exposure detection, the WISE source information is given. This is not a vetted list of solar system object detections. Refer to the Moving Object Tracklets for such a reliable list. Beginning April 14, access to the WISE Preliminary Release data products initially will be via the on-line services of the NASA/IPAC Infrared Science Archive (IRSA). IRSA services are VO compatible. Simple and complex queries on tabular data products including the Source Catalog, single-exposure source database, known solar system object possible associations, and image metadata tables can be made using the IRSA/GATOR general catalog query engine. 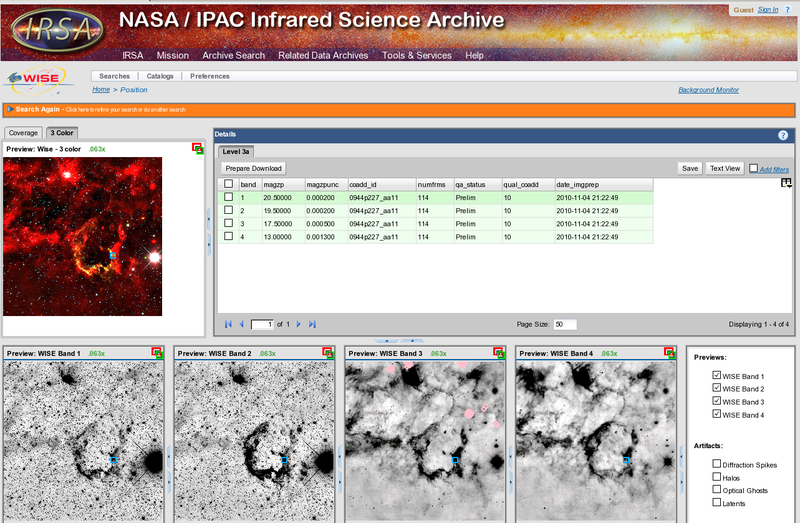 The IRSA/WISE Image Service (Figure 9) enables viewing and downloading WISE Atlas and Single-exposure image sets using via position/area-based and object named queries, including a special solar-system object name or orbital element search capability for the Single-exposure images. Figure 9 - Screen capture showing the result page returned by the IRSA/WISE Image Service for the WISE Atlas Image covering the supernova remnant IC443.